“Energy and Clmate: Surprising Things You Need to Know,” is set for 6:30-8 p.m., Thur., Mar. 1, at Berkeley City College’s auditorium, 2050 Center St., between Shattuck Ave. & Milvia St. 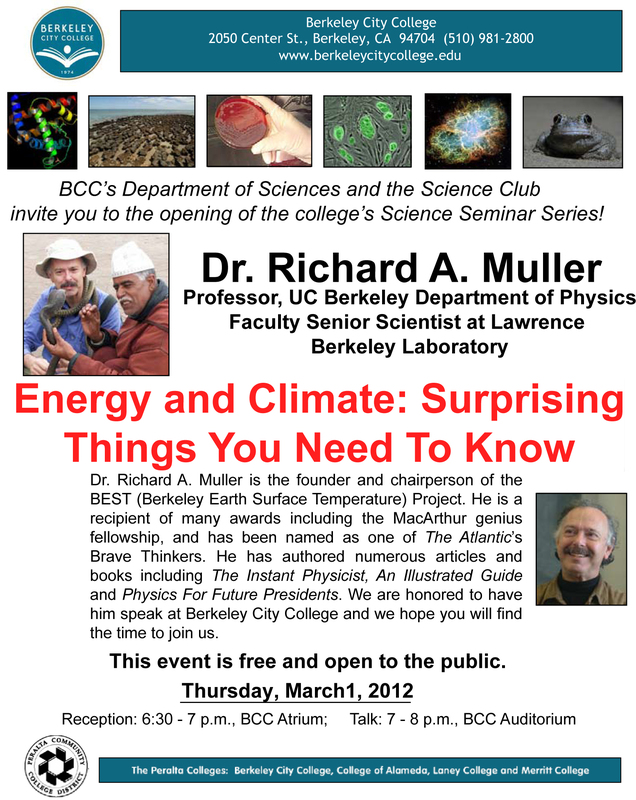 The presentation will be given by Dr. Richard A. Muller, renowned professor of physics at U.C. Berkeley and faculty senior scientist at Lawrence Berkeley Laboratory. The event, which is free and open to the public, is sponsored by BCC’s Department of Science and the college’s Science Club. It is part of a five-part Spring Science Seminar Series. Dr. Muller will discuss the latest scientific developments on international climate change and how the world can best prepare for them. He is founder and chair of the Berkeley Earth Surface Temperature (BEST) Project and a recipient of the MacArthur Genius Fellowship. He also was named as one of The Atlantic Monthly’s Brave Thinkers. Muller’s numerous books and articles include The Instant Physicist: An Illustrated Guide and the popular Physics For Future Presidents.